The legs & feet of your dog or cat need regular care to prevent injury and stay healthy. We'll help you train your pet to allow leg and paw handling. The legs and feet of your pet do a lot of work and need regular care to stay healthy. The feet, in particular, require regular examination to ensure that nothing compromises your pet's ability to walk and run. Grooming the legs can prevent injury, so it is important to train your pet to allow leg and paw handling. Building up positive (pawsitive?) association in your pet will go a long way to making grooming time easier. If you start at the top of the foreleg with a long haired pet, you'll notice that the fur around the elbows and the 'pits' can be a location for mats. Keep these areas combed and clipped down and you will worry less about mats and hotspots forming. The long fur on the forelegs can be trimmed back or just shaped. If your pet mats frequently, it is usually best to trim this fur closely against the foreleg. The carpus, or wrist, should be clipped carefully, as it protrudes somewhat and can be accidentally nicked if you are grooming a thickly coated pet. Use the Scaredy Cut attachments to prevent nicks and keep the trim uniform. The hind legs should be brushed out completely before attempting clipping. Pets with thick hair on the back of their hind legs can acquire all manner of debris in the course of sitting or moving about, so it is better to ensure that the only thing you are clipping is hair. Start at the bottom and work your way up, just as you would Scaredy Cut the body. Go very slowly through thicker hair, as too much hair will just interfere with the scissors' ability to make a clean cut. It is sometimes a good idea to 'rough cut' areas of thick hair - get rid of the bulk of hair first and then clean up the trim afterwards. 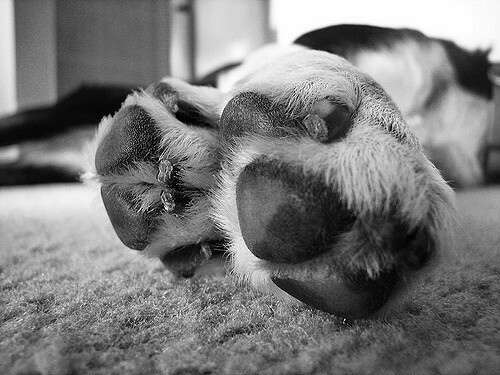 Many pets are sensitive about their feet, so handling should begin well before grooming is attempted. Trimming the feet prevents dirt, debris and snow from forming mats that interfere with walking and running. Check for cuts, debris - anything that might cause problems during grooming. You may have to wash out something that can't be cut or teased out of the fur. The Tiny Trim™ is the best tool to trim around toes and below the wrist area. Hair between the toes should be shortened to the pad if not shorter. Trim around the feet, making everything even. 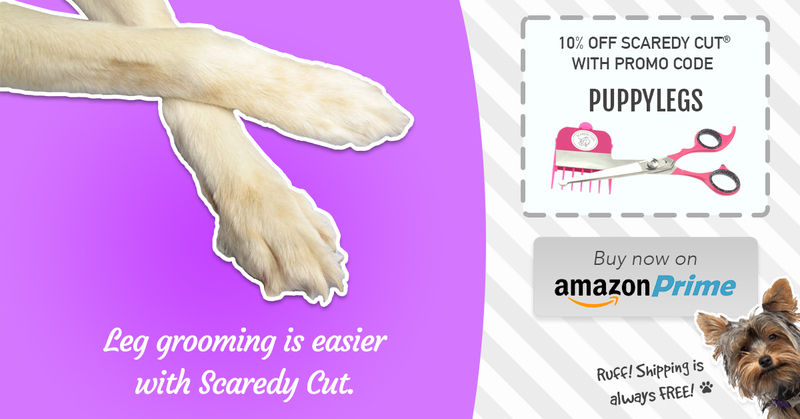 You may prefer to trim as closely as possible or trim to create a certain look to the paw. Trim around the toes and the 'V' between the paw pad and the toe pads. Trim below the wrist, taking care not to nick the pad there. Trim around the dewclaw. Nails are one of the challenges of a sensitive pet. It can be best to relegate this to someone experienced who can do it quickly, with a minimum of fuss. However, if you have a pet that gets extremely stressed when faced with a groomer in any capacity, you may have to learn how to trim nails yourself. This is best learned from a seasoned professional who can demonstrate how to trim to the correct length and how to avoid cutting the quick (blood vessel within the nail).